Two quality 24 % lead crystal made in Germany. Original labels are still affixed. Set of two matching beautiful crystal glasses from Galway. Hand cut in Ireland. Original Galway Crystal labels still attached. Feels perfect in your hand with just the amount of weight at the bottom. RCR Fusion DOF Glasses 4 Lead Crystal. RCR Fusion Stem Water Goblets 4 Lead Crystal. • 11 ounce. Boxed set of 4 Glasses, Made in Italy, 24% Lead Crystal. This is a set of 5 signed Rogaska rock glasses. Still in original box never used. Great design and etching. Size is approx 4" tall and approx 3 1/2" wide at opening. Wont find better. RCR Fusion Moka Cup & Saucers (2) Lead Crystal. Royal Crystal Rock. Only 2.75 ounces. RCR Fusion Stem Wine Goblets 6 Lead Crystal. • 8.25 ounce. Boxed set of 6 Glasses, Made in Italy, 24% Lead Crystal. RCR Fusion Hi-Ball Glasses 4 Lead Crystal. RCR Fusion Stem Water Goblets 6 Lead Crystal. • 11 ounce. Boxed set of 4 Glasses, Made in Italy, 24% Lead Crystal. RCR Pisa Double Old Fashion GlassesEngraved Lead Crystal. The RCR Da Vinci logo is etched on the bottoms. Made in Italy by Royal Crystal Rock. From their Da Vinci barware collection. RCR Pisa Wine Goblets Engraved Lead Crystal. The RCR Da Vinci logo is etched on the bottoms. 4 ounces 7" tall. Boxed set of 6 wine stem glasses. Made in Italy by Royal Crystal Rock. From their Da Vinci barware collection. RCR Carrara Wine Goblet Lead Crystal Stemware. Made in Italy by Royal Crystal Rock. Hand cut 24% lead crystal. From RCR's Da Vinci barware collection. The RCR Da Vinci logo is etched on the bottoms. This is Franz Wittwer crystal and the pattern is Saskia, circa 1966, which is now discontinued. Excellent condition. Brilliant, sparkly, nice weight, pinwheel design. hand made cut crystal scotch, vodka, whiskey rocks glasses. Each glass holds approx. Beautiful Lovely Set of 2. Unsigned, I do not know the maker. Áurea RCR Royal Crystal Rock. Novecento Pattern. Ice Bucket. Royal Crystal Rock. Set of 4, Badash Galaxy, crystal "On The Rocks", glasses. Glasses hold 10 ounces each. Clear heavy, crystal with air bubble base. Dishwasher safe. Gorgeous set of four Royal Crystal Rock Zeus Water Goblets. These crystal goblets stand 5 3/4" and feature a vertical cut bowl. RCR Laurus Water Glasses 6 Royal Crystal Rock. Made in Italy by Royal Crystal Rock. Barware, glassware, stemware. • six 7.5 ounce stems. Boxed set of 6 goblet stems. One box has 2 candle holders and 2 candles. The other box has the candle holders only. IT IS STAMPED RCR WITH CROWN AS SEEN IN PICTURES. ROYAL CRYSTAL ROCK. BOWL WAS ACQUIRED IN A STORAGE SPACE WE BOUGHT. HIGH LEAD CRYSTAL. DEPTH : 4 3/4". HEIGHT : 7 7/16" TALL. SO DO NOT KNOW HISTORY. Royal Crystal Rock (RCR) 24% Lead Crystal Pitcher, 7 1/2"32 Ounce. Looks to have little or no use. The pattern on this pitcher is crisscross with vertical cuts like Lismore. It has a good substantial handle, excellent for any beverage. RCR ROYAL CRYSTAL ROCK. 7" CANDY DISH. Bowl Center Piece by"Oneida" RCR. Zeus by Royal Crystal Rock. Cut ~ Verticals ~ Clear ~ Textured Base. Classic Style. Made In Italy. Set of 6 Water Glasses ~ 5-3/4" Tall. Royal Crystal Rock (RCR) Champagne Sherbet GLASS SET OF 4 Shannon Pattern 5"
On sale one SET OF 4 RCR Champagne Sherbet GLASSES. Logo stamp on undersides. CONDITION is pre-owned. Pattern OPERA. Material Crystal. Condition Excellent. Notes EXCELLENT: Great, nearly new condition. May have one or two marks, or a tiny bit of wear. Great, nearly new condition. May have one or two scratches, or a tiny bit of trim wear (if applicable). Royal Crystal Rock (RCR) 24% Lead Crystal Pitcher, 7 1/2"32 Ounce. The pattern on this pitcher is crisscross with vertical cuts like Lismore. It has a good substantial handle, excellent for any beverage. 1 Bowl 10.5" Height 5.5. 6.4lbs of Crystal. Very good condition for its age. 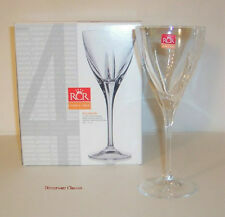 RCR Royal Crystal Rock Set of 6 Ambassador Champagne Glasses. 24% lead crystal. Excellent pre-owned condition! Set of 2 shell style candle holders with candles included. Over 24% lead crystal. Box is a little crushed on one corner (see photo) and the back of the box is a little scuffed where a label was removed but otherwise this set is in perfect condition and has never even been removed from the box. Rock Star Crystal Decanter striking shines beautifully - a mans decanter - Bold-your whiskey needs it - with pair rocks glasses . Shipped with USPS Priority Mail. Set of 3 Chivas Regal rocks glasses by Rastal. Made in France. Gold crest logo on the side of each glass, slightly faded from age. These glasses are quite unique in shape. “France” embossed on the bottom. Daisy and button style. Crafted in a “Daisy and Button” style pattern. Straight sided without any taper or flare. Highly polished to accentuate the brilliant clarity, provide maximum light diffraction and present a beautiful presentation and visual effect. 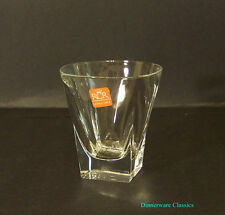 Royal Crystal Rock Aurea 3 5/8" double old fashioned tumblers (6) in excellent condition. Good luck.